Happy Monday, friends! I hope that you had a wonderful Thanksgiving. I am so excited for the Christmas Season to begin. There are so many exciting things happening. This week the sweet and talented Chloe at Celebrate and Decorate is hosting a Holiday Tablescape Blog Hop. As an added bonus, the following week, she is hosting a Holiday Home Tour Blog Hop. How exciting is that? I am so honored to be participating with such a wonderful group of ladies. A schedule for this week’s blog hop is posted below. You will want to be sure and visit all of the other bloggers. There will be lots of gorgeous inspiration to help you with your holiday decorating. All weekend, I have been busy with my Christmas decorating. I can’t wait to share my Christmas home tour with you next week. For today, I would like to share my Christmas mantel with you. My color theme this year is red, blue, silver, and gold. It is tradition to bring out my Santa picture each year. My kids love this picture, and I can’t decorate for Christmas without it. I hung blue spruce garland accented with pearls, pine cones, and eucalyptus leaves on the mantel. It has lots of tiny white lights scattered throughout it that add such a wonderful, warm glow at night. This garland was something new I purchased this year from Balsam Hill. I made bows with streamers in my theme colors and placed them at each corner of the mantel. My favorite Santa is placed on the hearth of the fireplace. Please be sure to check out the gorgeous tablescapes on the blog hop this week. I know that you will find lots of inspiration for your beautiful holiday tables. I am scheduled to present my tablescape on Wednesday. Therefore, Tablescape Thursday will be a day early. Thanks so much for stopping by today, and I hope that you have a wonderful and blessed day!!! It looks beautiful! I have been decorating since Wed. afternoon too. Merry Christmas! Thank you, Pinky! Merry Christmas to you too!!! Shannon, your mantel is so beautiful…love your color scheme and the new garland is perfect. I am looking forward to the blog hop both weeks and seeing your lovely home and Tablescape! Let the parties begin! Thank you, Pam! I too am looking forward to the wonderful blog hops! It is so much fun! I hope that you are having a great week!!! Love love the mantel scape. The Santa pic is great. I’ve been looking for one similar in size. Glad to know you liked the garland from Balsalm Hill. I get their catalogs but have not ordered. Thanks for sharing. Thank you, Mrs. Lane! I found my Santa picture several years ago at Kirlands. I know they carry similar wall art every year. I hope that you are having a great week!!! I love your Christmas mantel and your new garland Shannon! Looking forward to seeing your tablescape and home tour! Thank you, Mary! I’m so happy that you stopped by, and I hope that you are having a wonderful week!!! Shannon, Another stellar presentation! I always enjoy anything you have to offer. The blues and Kris Kringle on the mantle with all those greens look fantastic. Thanks for the post. Enjoy your week! Nancy, you are too kind! Thank you so much for your sweet comment. It made my day! I hope that you are having a wonderful week!!! We’re on the same wavelength today, Shannon. Love your color theme – so pretty! Happy Monday! Thank you, Kristy! I noticed that we were on the same wavelength too! You showcased so many pretty Christmas mantels. I hope that you are having a wonderful week!!! Oh Shannon, this is adorable! I know your kids love the Santa painting! Thank you, Jenna! I hope that you are having a great week!!! Such a pretty mantel, the garland is lovely and I love the picture of Santa! I am looking forward to your tablescape on Wednesday! Thank you, Chloe! I hope that you are having a great week!!! Your mantel is beautiful. Love both your jolly Santas. Thank you, Eilis! I hope that you are having a wonderful day!!! Your mantel is delightful! I know your kids do love the Santa’s. Your garland is so real looking and I love the bows. Looking forward to your tablescape tomorrow. Thank you, Bonnie, for the sweet comment! I really enjoyed your tablescape this morning. It was absolutely beautiful! I hope that you are having a wonderful day!!! Mantel looks so festive – also love the picture of Santa. I also have one I hang every year! Thank you, Patty! I’m so happy that you stopped by, and I hope that you are having a great week!!! Shannon, I agree with your kids that the Santa painting is a must, Love your bows on the mantle. 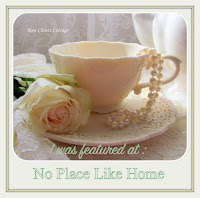 Loving the Tablescape Blog Hop! Thank you, Carol! I hope that you are having a wonderful weekend!!! I am off to a very slow start with my decorating but I’m very inspired by what you have shown here. Hubby likes the traditional red/green and I’m leaning more towards white and metallics. This should be interesting! Thanks for sharing with us at Celebrate Your Story Link Party and have a great weekend. Thank you, Sandra. I am so happy that you stopped by, and I hope that you are feeling better!!! Beautiful! Love the Santas and the blue and white. The “greens” are so pretty. Thank you so much, Richella! What a sweet comment! I’m so happy that you stopped by, and I hope that you have a wonderful weekend!!! Lovely as always. I enjoy seeing everything you post to see how you have incorporated blue. Your ribbons add a perfect touch to the garland. Your Santa print is a treasure. Thank you for sharing at Monday Social. Judith, you are so sweet! Thank you so much for your kind words. Also, thank you for hosting Monday Social. I hope that you have a wonderful weekend!!! Merry Christmas!!! I love how your Blue & white ceramic collection still ties in with all the Christmas! Perfect! Thank you, Vel. I love blue and white china and porcelain!